The Seeker Fishing Rod Company is a “Made in America” brand where 100% of all Seeker composite blanks are built in-house. Each rod is taken from flat raw material and through a series of processes is turned into a fishing rod blank of ultra-high quality. Each Seeker finished rod is assembled by specially trained assembly technicians. We carry several Seeker Rods. If you do not see the rod you want, please contact us, we may have it in shop. All of these rods are "Deckhand" style (Cork Wrap). Each rod is built on a hand made blank in black. 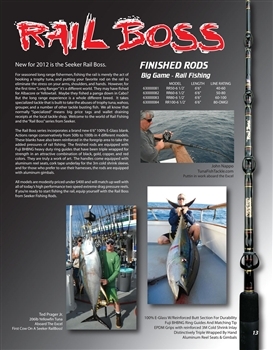 All rods feature either Fuji Graphite or Perfection Tip Co. anodized aluminum reel seats. Grips are durable hypalon. Tips are Perfection carbide or Aftco rollers. Guides are Perfection superior bright Hard Chrome or Aftco chrome rollers. All rods are double wrapped, with triple wrapped roller stripper guides, in brilliant metallic blue and black with silver trims. Rods are then hand finished with three layers of durable Classic Coat epoxy coating. Please select model. These rods are 6 1/2" long designed for rail fishing. Designed to fish 50-100lb line classes. American Titanium frame guides with Nanolite inserts are 100% corrosion resistant (no welds, 100% Titanium). The reel seats are 6061-T6 Aluminum black hard anodize. The AFTCO black and gold stripper roller guide is a big foot for better alignment of line coming off the larger reels. Triple wrapped guides with the Titanium frame reduce finish cracking. Cork tape rods have the Diamond shrink tubing over cork tape with Turks Head Knot to increase the cosmetics of these rods.